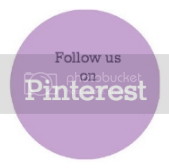 Savvy Chic Avenue is your blog source for fashion, weddings, DIY, social events, cooking and all things Savvy and Chic! Even though Christmas is still just a few short days away (eee!!! Hope you’re ready!!) we hope you’ve at least put a little thought towards New Year’s Eve. Do you know what you’re doing, yet? Will you be going out to an even? Heading to a NYE party? Throwing your own party? And of course the most important – have you decided what you’re wearing? Yes, your mind may be filled last minute Christmas details, but that’s okay! Because thankfully we’ve done some of the work for you! We’ve scoured the Internet looking for NYE party tips, decor, recipes, and more. Wine and champagne bottles are fabulous and you can take them to the next level buy painting them gold. This is super easy to do and it looks so chic you almost can’t handle it! You can use empty bottles as centerpieces and fun decor or you can even amp up the glam factor on unopened bottles to use as functional decor. Now when we say simple we mean simple! It’s so easy it’s almost fool proof! Just take the bottles outside, in the garage, or another well ventilated area and lay out some old newspapers and spray the bottles with 1-2 coats of gold spray paint. If you want to add a little extra touch of glam wait for the paint to fully dry then spray with a clear finish or adhesive and roll the bottle in glitter. 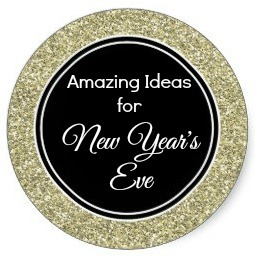 Place some festive NYE themed framed art around the party area for some super cute and quick decorations. You can use old frames you have laying or buy a few cheap frames from the thrift store (don’t have any to go along with your color scheme? No problem! Paint them!). With a few key strokes on Google you have can find tons of free NYE printables like the ones we found at A Night Owl Blog. If you get them without the year on them you can reuse these for any future NYE parties. This centerpiece is perfect for NYE! Fill a rectangle box (or use a window flower planter) with silver and gold ornaments. Next cut out the year from card stock and stick them in the ornaments like Lil Luna did here. Who doesn’t love a photo booth?! They’re so easy to do! Simply set a camera to self-timer mode, secure it to a tripod, and get ready to have some fun! What’s a photo booth without funny props?! You can find a bag of props at your local party store or you can print these props out at home and make them yourself. When it comes to photo booths you can make them as simple or extravagant as you’d like. You can use a plain wall as your backdrop or you can create something a little more festive (if you have the time!) by creating this diy gold sequin backdrop from Oh Happy Day. As the tale goes, when the clock strikes midnight on NYE it’s time to share a kiss for good luck in the new year. Make sure every party goer has the chance to bring in the new year by creating these cute little baggies full of chocolate kisses labeled midnight kisses. We love this idea and they make an adorable little party favor! Who doesn’t love Oreos? How about Oreos dipped in chocolate?! These Tux & Pearl Oreos look incredibly fancy and they’re super easy to make. Just dip half an Oreo in melted white chocolate and decorate! That’s it! Keep the food small and simple by offering a variety of dips. Some of our favorites are spinach queso, green chili, hot cheese dips. Have a cocktail or two… After all it is New Year’s Eve! 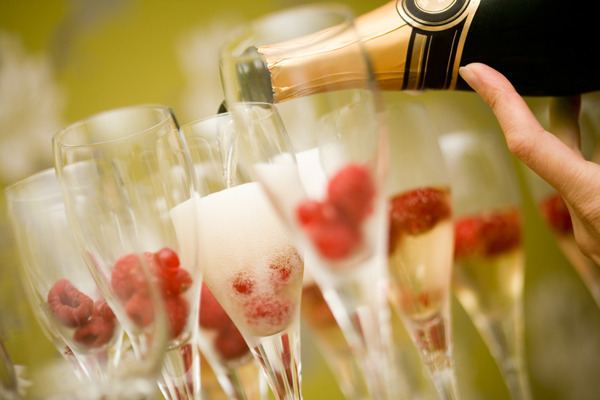 It’s a moment of celebration and we’ll raise a glass to bringing in the new year! A few of our favorites include Cranberry Cheer, Pomegranate Margaritas, and Tickled Pink.